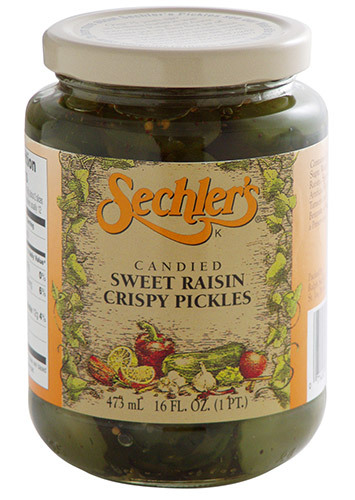 16 ounce Candied Sweet Raisin Crispy Pickles are a unique combination of candied, thick-sliced pickles, raisins, and spices. From Anonymous of Lilburn, Georgia on 5/10/2018 . These pickles are amazingly delicious! From Anonymous of Clinton, New York on 10/16/2017 . Candied Sweet Raisin Crispy, The Best! From Donna LaPietra of Chicago, Illinois on 10/12/2017 . We buy a full case, never want to be without! SO DELICIOUS! From Judy Tremmel of Westchester Il, Illinois on 3/18/2017 . From Melody Snider-Burks of Martinsville, Indiana on 1/17/2017 . My sister in law and brother in law bought a huge jar of these pickles for us last summer. I actually thought we'd never even eat them. But when I started putting them out for my family at picnics and holidays,they disappeared faster than anything else in the relish tray. After our last get together in 2016, even though I tried to hide them so I had a few, they were all gone. My son found them in the fridge and put them out SO, I ordered these four smaller jars so I'd have a person stash! Everything about their great taste in the name. Love these pickles!